One of my fellow pilots was diagnosed and treated for Prostate Cancer about two years ago. Thankfully, he was successfully treated and now juggles a line flying role and a demanding management position. For at least the second year in a row, he is participating in Movember in aid of prostate cancer research and awareness in men over 40. Funds raised will help make a tangible difference to the lives of others. Through the Movember Foundation and its men’s health partners, the Prostate Cancer Foundation of Australia and beyondblue ? the national depression initiative, they are funding world class research, educational and support programs which would otherwise not be possible. In a world of new media, it’s not uncommon for people to ask for donations to help support their own online pursuits. We’ll never do this. We ask, instead, that you help support the people and charities that deserve it. Movember is one such cause. You can donate online Movember . 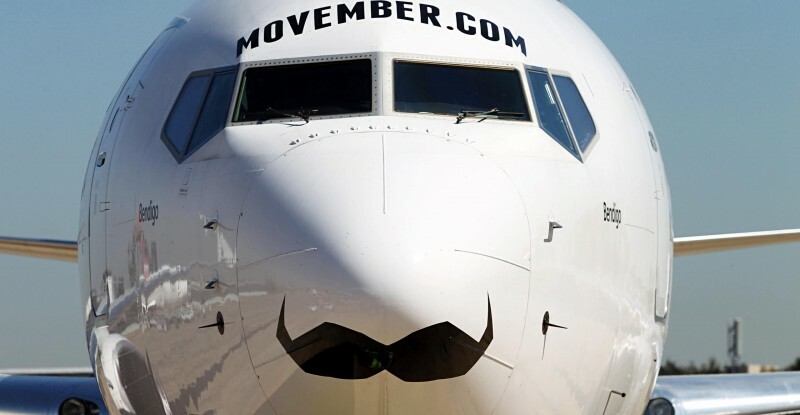 You will be taken to the Movember website where you’ll be able make your donation via credit card or PayPal. All donations over $2 (in Australia) are tax deductible. If you don’t want to pay online, you can write a cheque payable to ‘Movember’, referencing the Registration ID: 1047134 and mailing it to: Movember, PO Box 60, East Melbourne, VIC, 8002. You never know, you may board a V Australia 777 over the next month and be blessed with a big bushy moustache that you helped grow. Thank you in advance for supporting our efforts to change the face of men’s health.